Thanksgiving embodies the spirit of the holiday season. On this day each year, loved ones come together to count their blessings and relish in great company. When you host a Thanksgiving celebration, you want the perfect decorations to reflect the tone of the gathering, and the centerpiece is an important part of your decor. Discover the following four creative approaches to your Thanksgiving centerpiece. The aromatic scent of illuminated candles sets a comforting scene for a late autumn meal. Pumpkins also emphasize the harvest season. You can combine the two effects by making Jack-Be-Little pumpkin candleholders. To make the candleholders, hollow out the pumpkins, then create candle-sized holes in each one. Slide your candles into the empty slots; the roundness of the pumpkin bottoms will help to balance them. These handmade candleholders will help you set the mood and foster discussion at the dinner table. If you like the idea of a pumpkin for your Thanksgiving idea are wary of using an open flame in the area, another option exists. Many home decor and craft stores that stock novelty items offer metal pumpkin variants. Select the one that you feel has the best dimensions for your dinner table. Then spray the object with gold paint to craft a gorgeous centerpiece. Alternately, make your own by carving plastic foam into a pumpkin shape. Once you’re finished, use gold leaf to achieve a similar effect. Alternately, you may love the idea of a candle-based centerpiece, but you might think of pumpkins as October fare. In that case, celebrate “Bell, Book and Candle,” the classic autumn movie starring Kim Novak, Jack Lemmon, and Jimmy Stewart. Place a shiny bell on the table next to a stack of books. On top of the books, sprinkle a few festive autumnal flowers. Then place a candleholder on top of the books. Insert a candle into the candleholder, light the candle, and watch the flicker of admiration sweep over the faces of your movie-loving friends. Miniature trees are one of the easiest decorations possible. The trees are readily available, and making a fall tree centerpiece from one is simple. Pick a tree size that will attract attention without blocking the view of your guests at the table. You’ll also want something that embodies the season. If you choose an artificial tree, remember to select one with leaves that feature the proper fall colors. Since a tree centerpiece can be a bit dull on its own, you’ll want to embellish the look by adding some illumination. LED lights from Christmas Lights Etc are a wonderful way to celebrate the current holiday while reminding your guests of the upcoming Christmas season. A Thanksgiving tree filled with Christmas lights can be one of the most festive centerpieces imaginable. 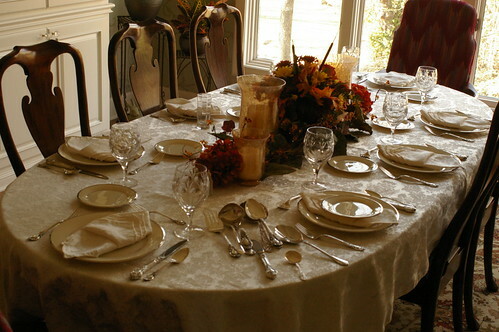 Selecting the perfect centerpiece for your Thanksgiving celebration requires a bit of forethought. You want something that reflects who you are and what you want your decorations to say to your loved ones. This approach is easy to do if you’re willing to do a bit of DIY crafting on your own. Simply follow the suggestions above or change them slightly for your own needs.